I can remember watching comedy shows as a kid where one of the characters would be sick in bed or laid up and having a bedside bell to ring for when they need assistance or help (getting a blanket, need water, turn off the light, etc.). And then sometimes the other character would respond to the bell multiple times in a row having it become quite the involved process with many back and forth trips to help the character in bed. The old ringing the bedside bell for assistance does work to get someone’s attention within the home. 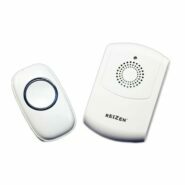 However, there are better options and assistive technology devices available that can help someone needing assistance from the bedroom, bathroom, etc. while the caregiver is home. 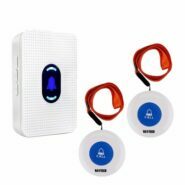 Vibrating Receiver with small flashing LED has 4 adjustable volume levels and comes with 52 ring tones. Indoor range through doors and walls is 30-150 meters. Has 250 meters range in open space. Receiver uses 2 AAA batteries. Call button uses a 12V 23A battery. Easy set up and to use. Simply by pushing call button the personal page transmitter sounds a chime. Works within a 100’ range. Comes with one transmitter and 2 call buttons. Approximately 800’ operation range in open space. Receiver has 55 ringtones to choose from. Provides 5 levels of volume up to 110 dB when paged. Receiver plugs into a wall outlet. Call buttons require 12V 23A battery. Comes with one watch and two call buttons. Up to 500’ operation range in open space. Watch receiver provides vibration and beep alerts when paged. Other features on watch include: Alarm Clock, Timer, Prompt Mode and Call Log. Easy to pair call buttons; however instructions on other functions of the watch are not clear and do take some time to get familiar with. Watch is powered by a rechargeable battery. Call buttons require a 12V 23A battery. Not sure what option is best for you? Please give us a call at 800-895-4728 to schedule a demonstration. 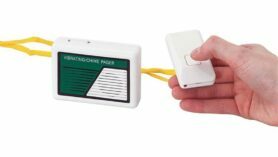 You can also rent one of these Caregiver Paging devices through ND Assistive’s Equipment Rental Program.